Home > Floral Decor > Flower Bouquets & Sprays > Silk Rose Bud - Red - 27 1/2" - BUY MORE, SAVE MORE! Roses are known for their exquisite beauty, graceful petals and classy elegance! Our new Long Stemmed Red Silk Rose Bud has all these wonderful features plus it won't wilt or wither away and it costs so much less! This single Rose Spray is 27 1/2" tall and the bloom is loaded with silk petals whose edges have a slight ruffle, just like live roses! The brilliant red blossom is about 3" tall and between 2" to 3" wide depending on how much you spread the petals. There is a minimum order of 2 Rose Buds. 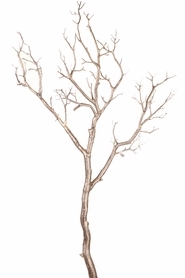 To enhance the natural look, the stem has silk leaves and even thorns but don't worry, they're plastic thorns! Details like this is what makes this long stemmed rose look so realistic! 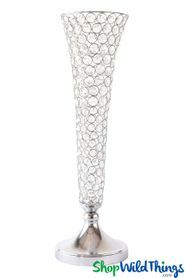 You'll be proud to display this beauty in centerpiece vases, bridal bouquets or use to decorate wedding aisles and arches or simply lay on a table! 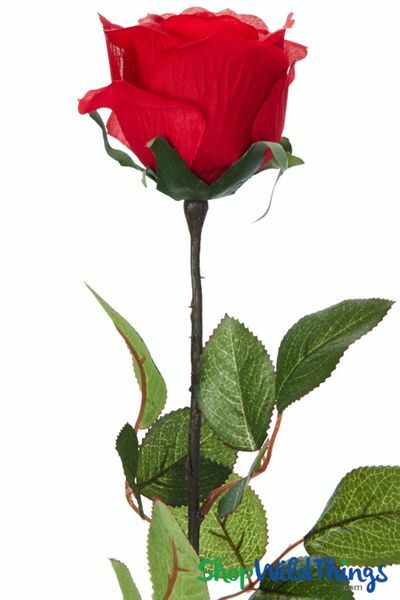 You can cut the stem and use this magnificent rose to decorate cakes, use as a corsage or boutonniere or in a hair clip. This long stemmed rose looks wonderful in Eiffel vases as well as our more elaborate Mermaid Vases. Always sophisticated, always fresh, always elegant! Whether your event is traditional, tropical, rustic or garden-themed, this colorful Rose Bouquet translates to stress-free decorating for your perfect day! second time purchasing from this site. prices are reasonable. wonderfully crafted. Prosbeautifully made. resembles real rose. Conspreferred closed bud. received open rose. hopefully receiving closed rose bud.